Trongsa altitude: 2,300m. Trongsa means ‘the new village.’ and the founding of Trongsa first dates from the 16th century. 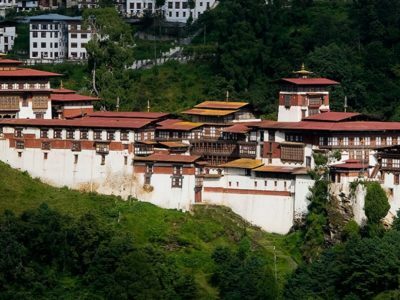 Trongsa is separated from both the east and the west by mountain passes. The landscape around Trongsa is spectacular, and for miles on end the Dzong seems to tease you so that you wonder if you will ever reach it. 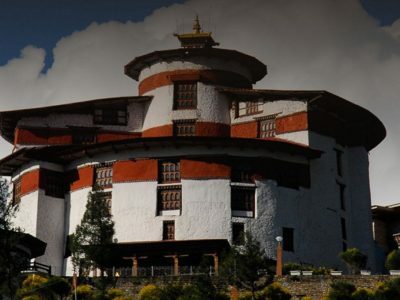 Backing on to the mountain and built on several levels, the Dzong fits narrowly on a spur that sticks out into the gorge of the Mangde River and overlooks the routes south and west.